Perhaps the main intention of Microsoft’s Kinect system was just for Xbox 360 and PC users for people to passively enjoy a massive amount of video games. There have been plenty of third-party efforts to utilize Kinect in the past, but the Massachusetts Institute of Technology (MIT) may have beaten everyone to the bunch. Many sources, including PCMag, have reported this week that the Computer Science and Artificial Intelligence Laboratory at MIT have developed a live mapping device that a person can wear that actually creates a map of the room that person is in in real time. The working device is pretty much at prototype stage, and by looking at it, it’s pretty clear that aesthetics were not really the priority. Given what it does though, that should not be the point of focus anyway. 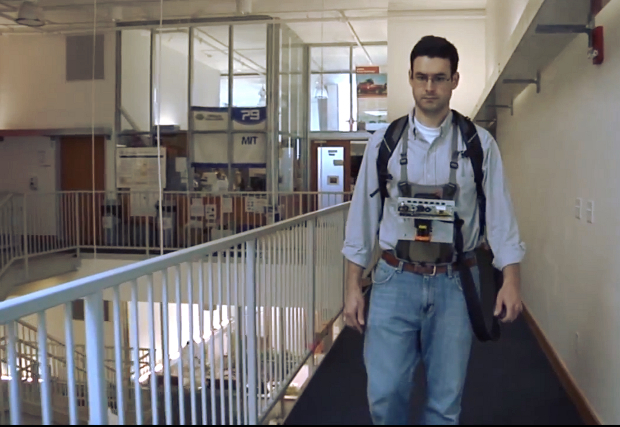 When the subject wears this device, which takes up a better part of the front torso, lasers measure depth perception and even air pressure changes to map out several floors. The sensors read at a 270 degree arc, which is enough to get a pretty full visual field. The information that is read and collected is wirelessly transmitted to a laptop that the wearer has in a backpack. It should be known that the Microsoft Kinect device is pretty pulled apart for the prototype, and only actually features the camera, but this serves as one of the focal specs for the mapping system. That information can then be transmitted live to another laptop for external viewers to look at. The visual field that the observer see is a birds eye view, and the collected information is almost immediate. Multiple lasers are meant to stabilize and make up for the naturally shaky movements of a person. So what is this type of technology going to be useful for? Well if you really think about it, it could be a massive step for the military. According to Slash Gear, the US Air Force, as well as the Office of Naval Research assisted with funding of the project. For personnel entering unfamiliar buildings and territory, this will be great help. The same thing could certainly be applied for firefighters as well. It looks like there’s still some work to be done with the device, but the first steps being taken are certainly something to revel at. Microsoft Kinect certainly has a role in gaming, but many should be able to appreciate it utilization in such a pertinent project. There’s reason to expect MIT and others involved to quickly mobilize on this project further given the benefits that it can possibly yield. Sophia Lirendo provided this article on behalf of Gadgetzz. Her interests often revolve around extreme gadgets (such as the one above), as well as entertainment gadgets and systems like Genie from DirecTV, and others. Share your thoughts on MIT’s recent efforts below!